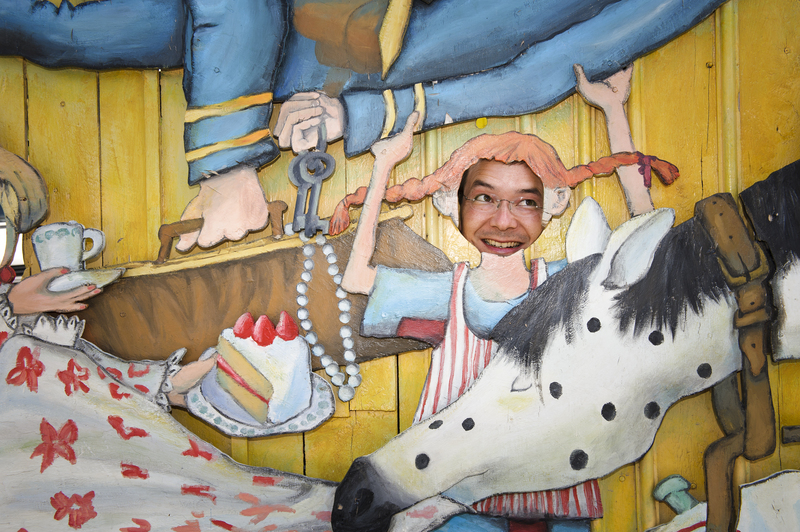 We´re talking about Pippi Longstocking of course. The first book about the world’s strongest girl was published in November 1945, but as it was Astrid Lindgren’s daughter Karin who came up with the idea about Pippi, and received the Pippi manuscript on her birthday on May 21 from her mother, the Pippi celebrations will take place on that specific day. – She is a 9-year-old child who is totally independent of all adults, because she is stronger than they, and do not need their money, says Karin Nyman in a press release from the Astrid Lindgren company Saltkråkan. It could have made her insufferably smug and contemptuous of others, but instead she became kind, generous and courageous. 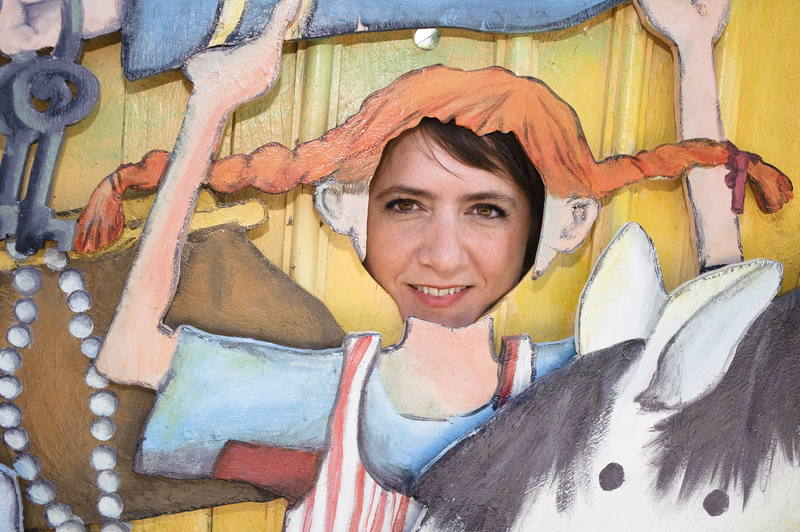 Pippilotta Provisionia Gaberdina Dandeliona Ephraimsdaughter Longstocking can look back upon an eventful life. It´s actually a few things she hasn´t been through. She has made millions of children, and some adults, from all over the world laugh and maybe become a bit thrilled, while she has driven some pedagogues, debaters and professors crazy. 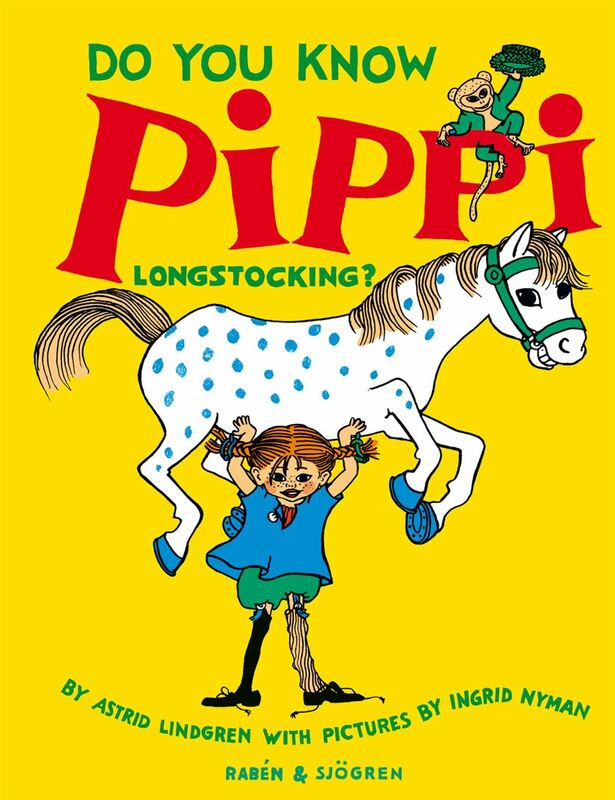 The books about Pippi Longstocking have been translated into 70 languages and have sold approximately 60 million copies. Saltkråkan will celebrate the anniversary throughout the year with free materials to libraries, schools and daycare centers. 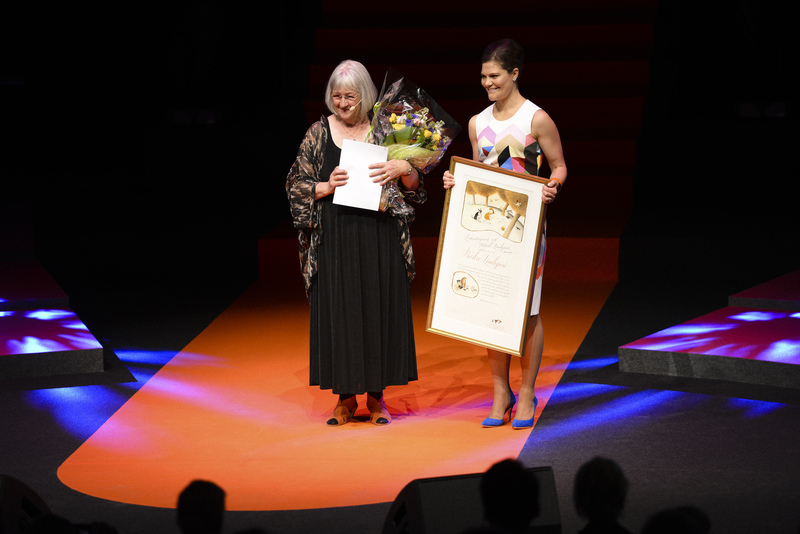 Do not miss this spring’s key dates for the Astrid Lindgren Memorial Award. To be marked in your calendar! This year’s laureate is presented at 1:00 pm CET at the National Library of Sweden. The announcement is broadcast live on www.alma.se/en and streamed live to the Bologna Children’s Book Fair, Italy. 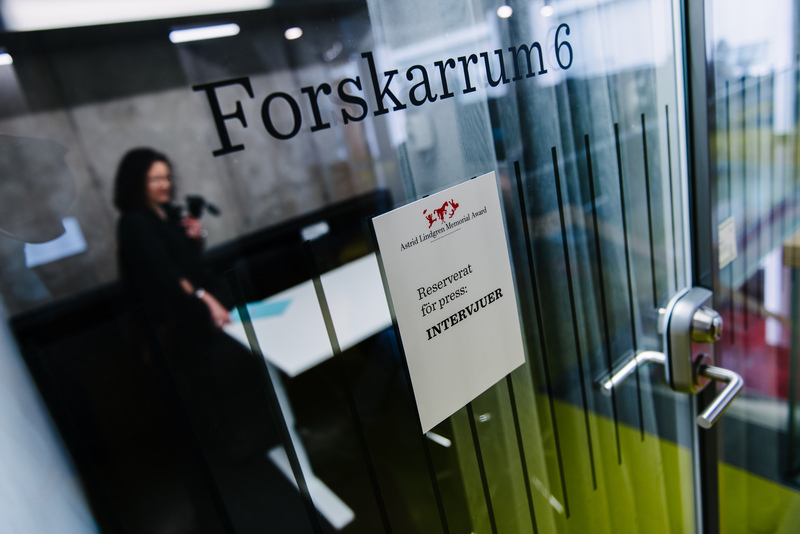 The laureate/s is presented at the Swedish Institute for Children’s Books in Stockholm. Open to the public. Admission free but limited seating. Award week including seminars, lectures, workshops and meetings with press and media. More information on the award week will be published later on. Award Ceremony at the Stockholm Concert Hall. The world premiere of the production was held at the Heath Ledger Theatre on Friday night as part of Perth International Arts Festival.The Rabbits, composed by popular and classically trained songstress Kate Miller-Heidke with Libretto by Lally Katz, and adapted and directed by Barking Gecko Theatre Company’s John Sheedy, is the short, sweet and straight-to-the-point story of the Marsupials, whose world is one day invaded by the Rabbits. The Rabbits (1998) is a symbolic portrayal of Australia’s colonial past or, more generally, of what happens when a technologically advanced culture meets one rooted in nature. 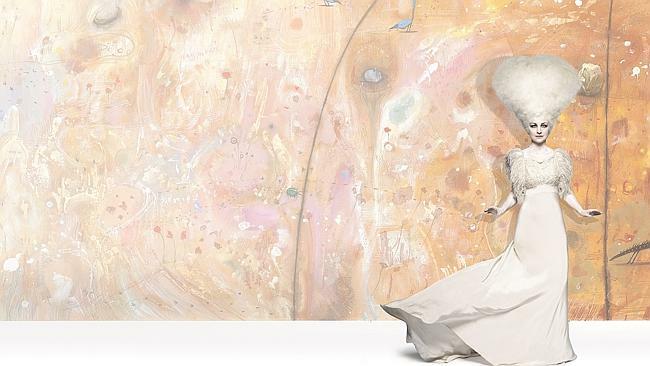 It was originally written by John Marsden and illustrated by Shaun Tan, who has described the book as a major step forward for him on a personal level. After initially not succeeding to get a proper feel for John Marsden’s text, he eventually found a solution. He presented, as he puts it, “… more unexpected ideas to build a parallel story of my own. Not an illustration of the text, but something to react with it symbiotically.” Shaun Tan describes The Rabbits as a story about power, ignorance and environmental destruction, but also as a dark, serious animal fable, a narrative form he believes is understood by everyone. Work in progress. Kitty Crowhter and Eva Lindström. Photo: Nordic Watercolour Museum. Fourth upon a time… Harriët, Eva, Kitty, Nadja, is the title of the new exhibition at the Nordic Watercolour Museum. 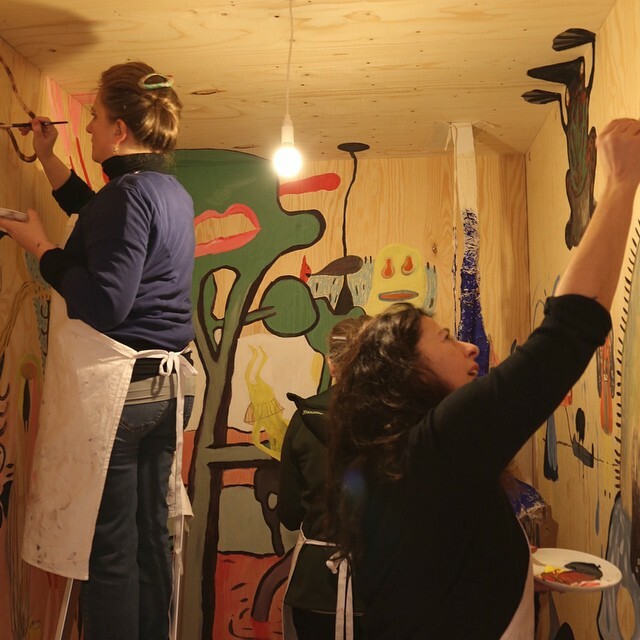 Four artists and picture book creators, Harriët Van Reek (The Netherlands), Eva Lindström (Sweden), Nadja (France) and 2010 ALMA Laureate Kitty Crowther (Belgium) have chosen to work together and let their different worlds collide and meet in new art, new pictures and new stories. 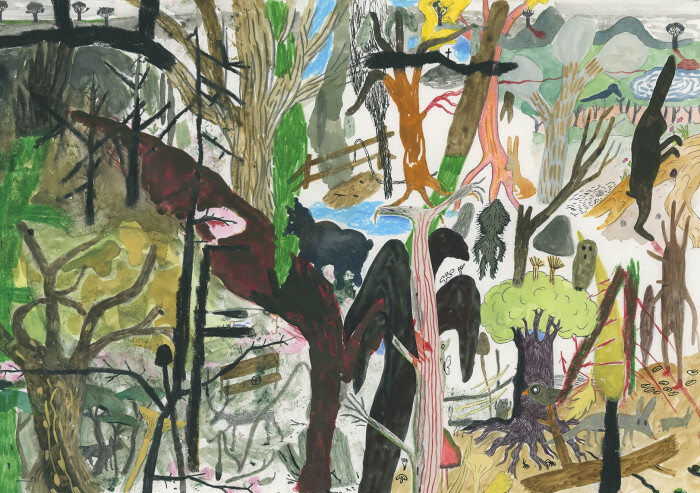 – The project started out when Kitty Crowther visited the museum a couple of years ago, she wanted to do a collaboration with other invited picture book artistes, says Sofia Olofsson at the Nordic Watercolour Museum. In the exhibition, the artists will present their books, but also completely different sides of their work. 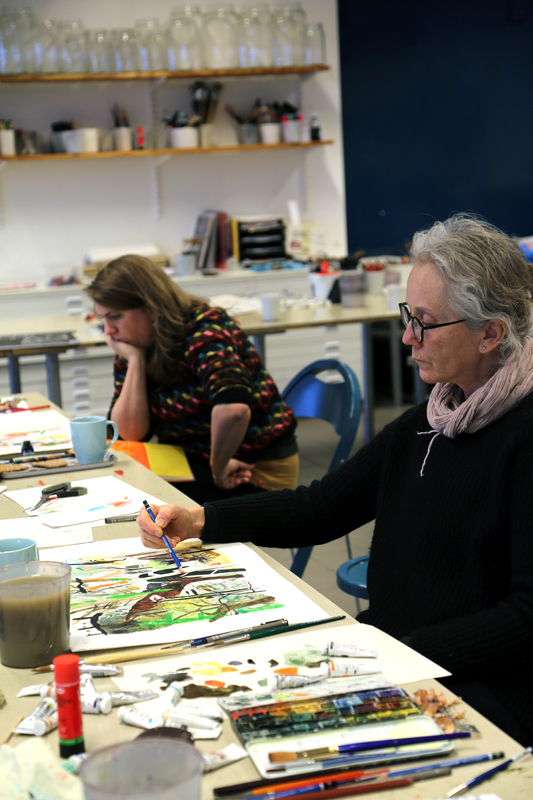 The artists have been working together in a workshop in December and February. – I´ve actually never done anything like this, Eva Lindström says in an interview with Swedish National Radio. It is a very tolerant atmosphere. What we talked about making the catalogue was that we not were supposed to be polite to each other, rather questioning each other’s pieces to see what that resulted in. – I love this awkwardness that´s not trying to please, saying “ah, be careful, you´re making books for children, it´s have to be pleasant”, children also have very strong feelings, and I get very annoyed when adults think “oh this is not for children”. Well, do you remember when you were a child? Yes? Well, then let´s talk about it. If you don´t? Well, just step back. The exhibition is available until May 3rd. He was perhaps 13, face shadowed under his hoodie. ‘Got any spare change?’ he asked. It was some time past ten pm in St Vincent’s emergency waiting room, where my husband was struggling to breathe with a bone caught in his throat. There were no free beds, so the doctors were attending him there, till the surgeon arrived. I gave him a little. I didn’t have much – I had not expected an ambulance ride at 9.20 pm. I knew where the money would go, too – into his arm when he ducked outside. It didn’t. He took it to the vending machines, chose a sandwich and a packet of chips. He gulped down the sandwich, then ate each chip more slowly than I have ever seen a child eat before, making each one last. I went back to my husband just as the registrar arrived to say they had found him a bed. And the boy who had no bed cheered for us and gave us the thumbs up as we went in. I couldn’t find him again. And that is why I accepted the role of Australian Children’s Laureate, 2014-2015. Because I reasoned that, yes, I wanted to give that boy a bed and the security that he would always have a bed and food. But I also desperately wanted to give him books because, when I was 15 and for a short while had no home to go to, my extraordinary, wonderful teacher gave me books, armloads of them, not just her own but ones she had hunted out or me. Because of those books I never once doubted that life could be good. Kids often have few choices about the life they live, but because of books I knew exactly the life I wanted. Because of those books I had the tools to reach it. And because of books I have lived that life, in a house I built (with a book of instructions and inspiration at hand) and wild animals about me, fruit trees and gardens, books to read and books to write. Once we believed that only bright kids read books. Now we know, via MRI scans, that reading stimulates the development new neurons and new connections between neurons, in a child’s brain (and in adults too, but the effect is far smaller than when the brain is actively growing). Empathy is a learned skill, and books and stories are the best way for it to grow. Each time a child reads or hears a story, they are the protagonists. No matter how small your social or physical world is, a book can take you across the universe. If we want intelligent children, give them books. If you want children free of prejudice, who can empathise so strongly with others that they will not knowingly or unknowingly do harm, give them books. If we want a future for this planet based on the best that humanity is capable of, give our children books. Teach them to read them, too. Australia is not good at this. One in eleven children has major reading difficulties. 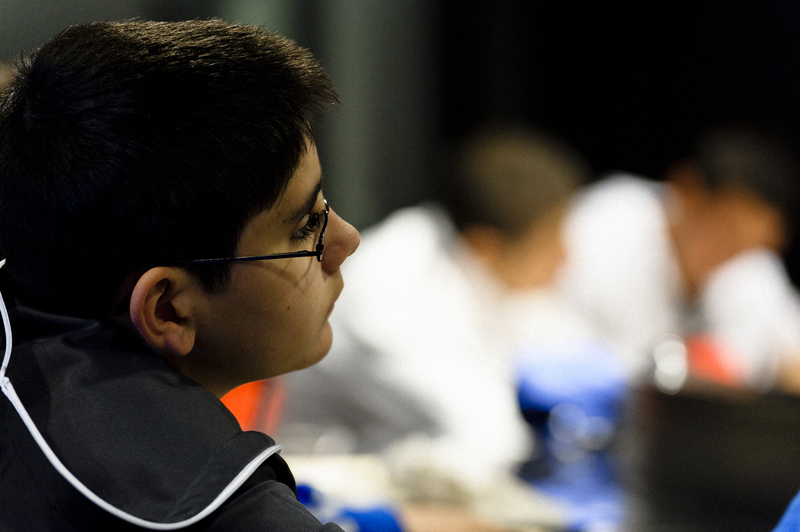 One in four does not reach the national literacy benchmarks. Few schools have paid professionals to tutor children who have literacy problems, but rely on volunteers to do so, or on the useful cliché unteachable’. In Tasmania, nearly fifty percent of adults are unable to read and understand the front page of a newspaper. In my own area, we found that over 40% of adults over forty could not read the chemist’s instructions on their medication. This is changing, but it has been, is and will be, a hard battle to get educational authorities and teacher training institutions to accept that every child can read and every child must learn to read – or we have failed. There have been many times when I have blessed the sheer existence of Sweden, and all of you who have fought – and won – what we must strive for in so many social areas, not just literacy. If Sweden can do it, so can we all. 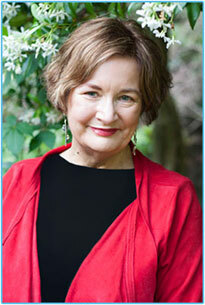 When I accepted the Laureateship, I thought I would be doing the same work that I have been doing for a quarter of a century – writing, speaking and using the power of books and storiesies. I had not realised how my own passion for the power of literacy and story would deepen, evidenced not just in what I say but what I write. In the past year projects have almost seemed to create themselves: the My Story Project, in partnership with the Sydney Writers’ Festival, where young people from racially diverse western Sydney are encouraged to write and share their stories, and the most eloquent will meet to talk about the present, the future and solutions to problems. The tentative beginnings of the Kabulwarnamyo Bush School in remote Arnhem Land where the community, as well as a committee I am privileged to be on, will try to design a school where indigenous kids can learn what they need to proceed to tertiary study if they wish to, without compromising the deep needs of country, pioneering techniques and understandings that may help solve some of the rifts and tragedies of Australian indigenous education. Next year I and my dear friend and passionate reader, Elaine, as well a her husband Chris, will speak to tens of thousands of Tasmanians; Elaine has no eyes and Chris, like me, is profoundly dyslexic, learning to read as an adult. He’s now a teacher. If we can learn to read, he’ll tell them, anybody can. And, no, you are not stupid if you can’t. The most profound experience was possibly in a detention centre, where Australia keeps those who have landed on our shores seeking asylum. The parents brought their children to hear a story. So many children lapse into apathy, unable to talk or smile, from the trauma they have experienced or the deep uncertainty of a life where you may be moved tomorrow, or find your living quarters filled with ten newcomers or your friends disappear as they are released. But how do you tell a story to kids with nearly thirty languages, none of them English and no translators? Never underestimate the power of story. We became animals, each child choosing their own, led by two Singhalese girls who appointed themselves my helpers. We danced through the centre, growling tigers growling at the guards, flying like cranes and butterflies across the table. All but one small boy, who sat and didn’t move. Mindful of regulations, I could not touch him, but the two small girls did. They hauled him to his feet, demanded to know what he was till he whispered a roar that told us who he had become. A dragon. And as he led us, uttering dragon roars, his father stood expressionless, with tears running down his face, watching his son respond and play. Never underestimate the power of story. 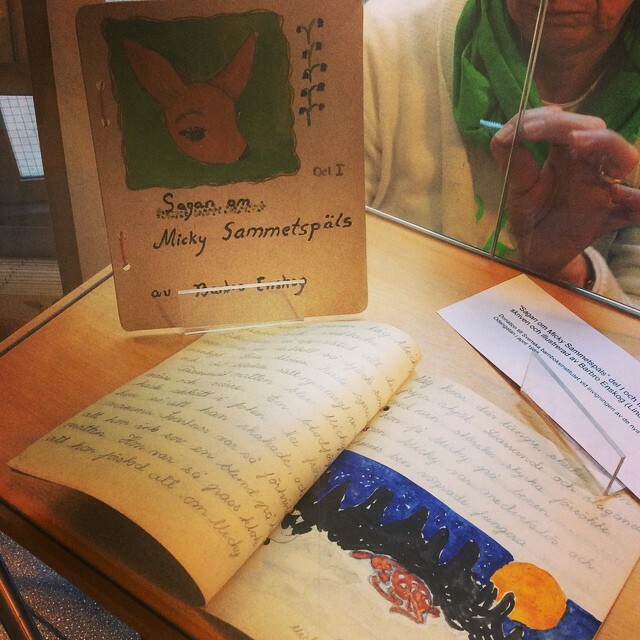 “…a suspicious resemblance to Bambi.” Barbro Lindgren’s description of the story written by her as a 12-year-old and sent to editor Astrid Lindgren at Raben&Sjögren.